This May, Mrs. Done by Forty and I will be traveling to central Europe with our close couple friends. We'd all gone to Hawaii a couple years ago and had a fantastic time so, we figured, let's try it again. We'll visit five cities over sixteen days: Vienna, Bratislava, Budapest, Krakow, and Prague. It is hard to express how excited I am about it. And thanks to Brad over at Richmond Savers, we'll be traveling with some (nearly) free flights and hotels, too. Being fairly new to the whole travel rewards thing, we find ourselves questioning how this is all possible. Why should these credit card companies give us flights and hotel nights in the first place? What's the point of giving away thousands of dollars worth of benefits to deadbeats like us, who never pay interest? Like grandma told us, it is better to just accept the gift horse. Normally I'd write about this travel while we were actually abroad or when we got back. But I'm planning on leaving the laptop behind this time around, and making due with only a cell phone. Unless the good folks at the hotel don't mind me clacking away on their lobby computer for a while. So, I figured I'd write a bit about our upcoming trip, in case anyone's interested in replicating the process for themselves. Never pay interest. Pay off your entire credit card balance every month (or, if you're a weirdo like me, every weekend). Work in pairs. The hotel card we used really hinges on two people working this plan together, so find the love of your life if you haven't already. Or, you know, a buddy. Get organized. Create a spreadsheet that shows when you signed up for the card, what the sign up bonus requirements are, when the annual fee will be due, and how many points you currently have. Optimize your spending dollars on the right cards. Let's say that in a given year, you put about $11,000 on credit cards for groceries, gas, restaurants, whatever. For every dollar you spend on a credit card, you can get back a certain type of reward. For us, getting two trans-Atlantic flights and 16 hotel nights was worth more than the 1% in cash we'd get on that $11,000 ($110). But for someone who doesn't have any interest in travel, or would rather have funds to pay down debt or invest, the 1%, 2% or rotating 5% cash back may in fact be a better deal. Optimize your spending for your own situation. Look around to get the Chase United Card when it has a 50,000 mile bonus (like it is now for business cards). Normally, the bonus seems to be 30,000. But when we logged in to our United frequent flyer account, we noticed that they'd occasionally have banner ads offering 50,000 miles (if you spend $3,000 in the first three months). You need 60,000 for a flight to Europe, so just fulfilling the sign up bonus requirement gets you most of the way there (50,000 bonus and another 3,000 for the money you actually spent on the card). Add your buddy/significant other as an authorized user and that gives you another 5,000. If you had any United miles at all before, like we did, you're probably over the 60,000 needed already. If not, you can just spend another 2,000 on the card in the coming months. Get the Club Carlson hotel card. Spend $2,500 in the first three months to get 85,000 points. While you do have to pay a $75 annual fee for this card, it does have a crazy benefit. When you book a stay for two-or-more nights, you get the final night for free. The best utilization of this benefit is staying in two-night increments. So, if you stay for two or four nights in a city, you get a 50% discount on any points used. Again, we have Brad at Richmond Savers to thank for this tip. With our two cards, we had enough points for 16 nights at different Radissons in the cities we wanted to visit: four in Vienna, two in Bratislava, four in Budapest, four in Krakow, and two in Prague. I'll write a quick review on the hotels when we get back, but from afar they all seem to be good, sometimes-bordering-on-fancy places to stay either in the city center, or a short tram ride away. Start looking far ahead for flights and hotel availability. We booked our flights about eight months in advance, and our hotels maybe six months out. It did take some coordination between the four of us, with conflicting work schedules and whatnot. My recommendation, if you're trying to do a large group together, is to try to plan the dates out in person or when all of you can get on a call. That's pretty much it. I'll admit that it does take a little planning and effort but, oddly, I found it all to be kind of fun. Maybe even a bit exhilarating. As someone who loves getting a good deal, travel rewards hits a very special nerve: it's the equivalent of finding an airline ticket in the 'give-a-penny, take-a-penny' tray. With the Euro taking a nose dive and the four of us only having to pay for meals and our train tickets between cities, everything's lining up for a great, affordable vacation. This all probably seems like bragging, doesn't it? Maybe it is. But I've always been one of those people who will tell friends about a deal I got. I'll tell my neighbors about our cheap cell phone plan and my family about the deal we negotiated with our internet provider. I can't help it. It may be a faux pas to speak about these sort of things. But isn't it a greater one to keep a secret like this all to yourself? 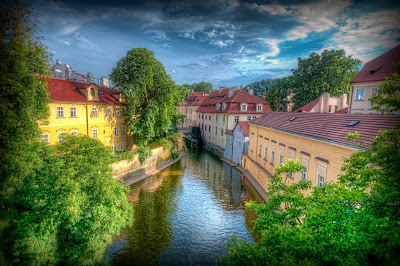 *Photo of Prague is from Fil.ippo at Flickr Creative Commons. Only counts if you fly in first! Ha! I've only flown in first class once, and while it's a great experience I don't think I'd spend twice as many miles just go have a nicer seat. I'd much rather use those points to go on a second trip...but to each their own. Seriously though, we have over 700,000 point/miles and we went to India and China last year (in first) and applied to 1 credit card in 2014. Gotta work the system! You're the blogger who buys a bunch of gift cards at drug stores and whatnot, right? I think I remember reading about your system a while back. The key difference, if I recall, was that we had drastically different levels of monthly spending. Re: first class, I think I might not have expressed my point correctly. I'm all for acquiring massing amounts of points. But the notion of paying two or three times as many points or dollars for a first class ticket does not appeal to me. I'd much rather use those X number of points to travel more often. I hear you, Jeremy. If it weren't for the overhead space, I typically want to board last. I'm in no hurry to get buckled in. We're definitely looking forward to the trip. And thanks so much for the advice on our next hack for New Years/Christmas. We decided on Paris but are expanding it to Berlin/London as well. I agree, DBF. Share the wealth! If someone else wants to judge your, or think you're weird because you/we do these kinds of things, forget them. You'll continue enjoying free* trips to Europe, and cheap, reliable cell service. Have a great trip! Can't wait to hear how the month of "shifting the spend" is going! Sneak preview: it's delicious. :) And I think we're accidentally saving money, but we'll see how that goes at the end of the month. Great advice! Thanks for writing it up. With your club Carlson card, am I right that if you stay two nights, you only pay for one? Yes, you totally have that right. The final night is always free if you stay for 2 or more nights. It took us about 5 minutes to realize we'd optimize that by staying in 2 night increments every time. Congratulations! Eastern Europe is lovely, especially that time of year, most college kids haven't gotten on the plane yet after graduation, so not super crowded :) I cannot wait until this whole mortgage thing closes so we can start our Disney trip planning for next summer - and I'm definitely calling Brad for tips once we're ready to go! Thanks, Three is plenty! I'm hoping we can beat the crowds by a little. Great advice, I'm starting to look into travel hack more and more too. I have only been to Vienna and Prague and thought both cities are really beautiful. Would love to go to Bratislava, Budapest, and Krakow one day. Thanks for the tips on Vienna and Prague, Tawcan. If you can remember a favorite bar or site, let us know! Whoa, 600k points? Well done. We are just starting in on the business cards (getting another 50k from the United Business one) but will be sure to email you on some others. Definitely a good time to go to Europe with the value of the Euro down - but are all of those countries on the Euro? Pretty sure Hungary is still on the Forint, at least. Good point about the currencies: Hungary, Poland, and the Czech Republic are all on different currencies. It does seem planning months in advance allows you the best choice of seats. But we've also seen some availability even just a few months out, so who knows? I just posted about the United MileagePlus card! My wife and I will likely both sign up for it and transfer all the points to one account so that we only have to pay annual fees on one of the cards. We also have a $800 voucher from my wife literally only waiting an additional hour and a half on our flight home from Houston to Minnesota a few weeks ago. Such a good deal! You guys will have a great time on your trip. Nice job on the voucher. For what it's worth, we've just cancelled the United cards right before the annual fee kicked in. They even gave us an extra 10k miles just to keep the card an extra month...and then we cancelled anyway. Awesome! Mr. Frugalwoods and I went to Bratislava, Vienna, and Krakow a few years ago and absolutely loved it. Krakow was easily our favorite city we've ever traveled to. I'm so excited for you--it's a beautiful part of the world. My wife was very happy to hear you comment about Krakow. It's a little out of the way but I think it'll be worth the journey. Travel hacking is awesome...I've mentioned it to a couple of people but keep thinking it'll wreck their credit (it won't if used properly). In any case, I wish I got in on it earlier. It's tough to travel with a little one at least in my opinion, but I did sign up for some cards to get free hotel stays. Might do some road trips in the Northeast. Not exciting as central Europe though! I hear you on the little one. We are talking about kids and know that we ought to get in our wanderlust while we can. Domestic travel, I think, is just as rewarding as international. The key for us is just going to some place we have not been. Seeing the 'new' is the part that gets our blood pumping. Sound like it's going to be an awesome trip! I'm insanely jealous! I'm churning a star wood card now in hopes of off setting fincon hotel costs. Nice! I really need to go to fincon one of these years. Starwood hotels are pretty swanky, in our opinion, too. We churned our way to a Sheraton in Buenos Aires and the receptionist hooked us up with the Club level floor (unlimited free snacks & drinks!). I had no idea such a thing existed, but see if they'll hook you up when you take your trip. This post is fantastic. I am bookmarking it for future reference. I have been seriously thinking about doing a major travel hack like this and this just gives me some inspiration to do it. Happy Travels! Thank you for the kind words, Jason. I'm always hesitant to share these kind of details, but hearing that they can help others try to do something similar is what I'm hoping for. Impressed that you're leaving the laptop at home, DB40! Seriously, though, travel hacking impresses me. I love reading about how people get huge discounts on big trips like this. I know you guys will have an awesome time! I'm so excited for you guys!!!! Can't wait to live vicariously through your posts. And amazing job on the hacks. I opened a rewards card a little while ago just to bolster my credit...had a couple rotating auto loans that had built it and my score was nice, but my "length of credit history" sucked because I didn't have anything else out. The rewards are nice, but I can't churn too much right now as our goal is to purchase our first primary residence in the next few years. After we're in that house, though I'm going to totally take full advantage of every single one I can. That Club Carlson one is amazing!!!!!! For what it's worth, travel hacking has not impacted our ability to get home loans or the rates we get for those loans. But...I know that there can be some modest degrading of your credit score in the short term each time you open a credit line and lower your average length of credit. Stephanie at the Broke and Beautiful Life had some good specific info on that front. Very excited for your holiday DB40, sounds like it will be awesome. It's crazy what you guys in the US can do with these credit cards and travel hacking. The market in Australia is nothing like this, so unfortunately I'll just need to save for my holidays the old fashioned way.... at least my wife is fantastic at hunting down bargains and creating great value holidays! As usual, we have it good in the US. I believe the travel hacking party will come to an end sometime, especially if it becomes more popular. So, is the Chase United card the best to get for free miles? Or what others would you recommend? And does it have to be a business card? I just bought a business this week and got a business card with Bank Of America, but it doesn't offer any miles, as far as I know. I'm new to the concept of travel hacking, but I'm from Europe and travel there almost every year. It'd be great if I could reduce the flight expenses, since those are the biggest. I have been to Budapest twice, and to Vienna and Prague as well. All beautiful cities! In Budapest, when you go to Castle Hill, don't buy any of the sweets for sale at the foot of the hill, they look good but are a total tourist trap, way overpriced.Instead, wait until you get up on the hill, There's a little pastry shop called Ruszwurm, I think, cheaper and way better quality. Also, the Market Hall at the end of Vaci Street is a must, especially for souvenirs and paprika. But be careful with the food area. We ordered a simple fried doughnut with toppings, and they didn't have any signs saying that each topping was a $1 extra. We told them to sprinkle everything on top (it was a small doughnut and wasn't room for that much), but they charged us $20 for one!!! I was so outraged, and really shouldn't have paid, but learned my lesson. So be careful, there are definitely tourist traps, signs are not clear and they won't tell you these things until you're ready to pay. Don't assume that things are like in America, assume they will try to charge you for everything extra. In Prague, order beer instead of water. They will charge you more for bottle water. Beer is delicious, weak, and cheap. Visit some old churches, they have great stories and awesome views from the towers. If you have time, you can do a day trip to Kutna Hora, an awesome little town with a famous ossuary. Also, the Prague Zoo is one of the biggest in Europe, I've enjoyed visiting it. In Vienna, the Ringstrasse is a must, of course. Also, go for a ride on the old, wooden ferris wheel, the one that you'll see on all the postcards of Vienna. It's in a park on the banks of the Danube, you can also rent bikes there and go for a ride through the vast, green park. We didn't have time, but a night out at the famous Opera would be nice. Also, a cruise down the Danube. The food in all those cities is amazing. In Budapest, defnitnely have as many forms of goulash as you can. And the Jewish District is littered with great bars and restaurants. DO NOT eat on Vaci street. Everything there is a tourist trap. Hope I didn't bore you with all this :)) Just reminiscing. Hope you have fun! And I know you definitely will. Such helpful comments...sorry for not getting to reply until now! I can't say that the Chase is definitely the best card. It does take 60,000 miles for a flight when it seems you can get to Europe on US Air and American for only 35,000 or 40,000 miles respectively, if you're willing to fly in the offseason. Hey, nice job guys! It sounds like you have a good plan. I still haven't gotten around to getting a Club Carlson card- maybe one day! I think it'd be a good card for you guys: lots of international options. Yeah, it's a real bummer. But it was great while it lasted. Go to remove sms tracker to find out what tracking features apps have today.